Observations of Paul Vincelli, Extension Plant Pathologist, University of Kentucky as of August 21, 2009. I (Paul Vincelli) just returned from a trip inspecting corn diseases through western Kentucky as far west as the Mississippi River, and here is a quick summary and comments. 1. Southern rust is prevalent in Kentucky, having been found in Fayette County and every western Kentucky field inspected. See most recent article in Kentucky Pest News, http://www.uky.edu/Ag/kpn/kpn_09/pn_090818.html. This disease can progress very rapidly on corn, since almost all corn hybrids vary from moderately susceptible to highly susceptible. However, incidence and severity vary widely from field to field. In some fields, it is hard to find; in others, many plants show leaf reddening and desiccation in the lower canopy and the upper canopy has a few pustules. It is a little difficult to decide when to pull the trigger on spraying fungicide, if for no other reason than to protect stalk health. Most fields I inspected were at early dent, which in my opinion is too late to treat with fungicides. The very few fields I saw that were in early dough might be candidates for treatment, but only if rust was present, easy to find, and producing abundant reddish sporulation in at least some spots in the field. Cool weather expected over the next few days will slow it down, which is good news. I think the main thing is that growers should scout all fields for stalk health as they mature, and schedule early harvests on those fields with weak stalks. In at least some cases, spending money on propane for grain drying probably makes more sense than a fungicide application. 2. Northern leaf blight is widespread but generally occurring at levels that will not hurt yields. There is also another look-alike out there: Diplodia leaf streak. This disease has lesions that look somewhat like Northern leaf blight, but the edges of the lesions are wavy like Stewart’s wilt. Also, the lesions might follow the secondary views like Stewart’s wilt. Lab diagnosis is the way to confirm this disease. The fungus that causes Diplodia leaf streak (Diplodia macrospora) is distinct from the common one that causes Diplodia ear rot and stalk rot (Diplodia maydis), but Diplodia macrospora will also cause ear rot and stalk rot. Diplodia macrospora may be increasing in occurrence in Kentucky; seed companies will want to keep an eye on this. -Late Breaking - Fall Armyworm on Soybean Making Impressive Appearance in Nearby Southern States! Click here to see the August 18, 2009 version of the Kentucky Pest News. Head scab (or Fusarium head blight) was a major problem across Kentucky in 2009. As farmers prepare for the 2009-2010 wheat crop, there are some things they can do. The latest Wheat Science newsletter addresses some of the lessons about wheat and head scab in 2009. Options for seed wheat are also considered. Late Breaking--- Fall armyworm on soybean making impressive appearance in nearby southern states! Reports from Extension Entomologists in Tennessee and Arkansas indicate that fall armyworm (FAW) populations in soybean are building up earlier and in larger numbers than normal. In Arkansas fields are being treated for a combination of FAWs and Corn earworm (CEW). In Tennessee the populations do not appear to be as widespread but some fields were in need of treatment. We can have this combination of insects in Kentucky soybeans. It is unusual, but it does occasionally happen. Likely places to check are late planted beans and fields in which the canopy has never closed. Historically, when this problem has occurred it is usually found in the Purchase area and the southern tier of counties in the Pennyrile area. No problems have yet been reported in Kentucky. Nevertheless, producers, consultants and scouts should be scouting regularly for these pests. They are in Kentucky; that is not the question. The question remains as always; are populations large enough to warrant a control? See Kentucky Pest News at: http://www.uky.edu/Ag/kpn/kpnhome.htm for more detail on late season soybean insect pests. 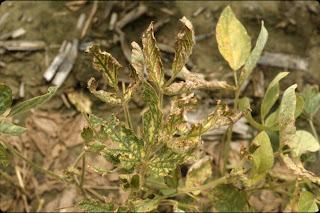 Probably due to the excessive soil moisture and cool July temperatures, soybean sudden death syndrome (SDS) is as widespread and severe as it has been in 20 years. The disease is actually caused by a Fusarium fungus that infects and rots the roots. The fungus then produces as plant toxin that results in foliar symptoms, especially interveinal yellowing and death, and severe defoliation and pod drop in severe instances. Typically a plant needs to be defoliating before the pods reach the R6 (full seed) stage in order for the disease to seriously damage crop yield. Normally, SDS comes in too little and too late to do much damage. However, the additional soil moisture early in the season probably supported additional root infection, which normally occurs during the early vegetative stages. There are tremendous differences in varietal susceptibility, and many producers have been lulled into a false sense of security with the limited SDS development over the past 10 years. As a result, I doubt that many soybean producers in the state have made SDS resistance a "must have" characteristic when selecting a variety. I don't blame them with SDS being such a limited problem overthe past decade. However, planting a highly susceptible variety is one way to encourage serious SDS if the weather and soil conditions favor SDS development. Dr. Chad Lee was recently called to a field in Boone County in northeast Kentucky to look at a problem field. What he found was a disease I had never seen in Kentucky at damaging levels: white mold. The disease is aptly named in that a white mold forms on the outside of stem lesions. In these lesions, mixed in with the white mold, you will also commonly see black structures, called sclerotia, which are the survival stuctures of the causal fungus. The disease was quite severe in at least one field. White mold is mainly a disease problem in northern soybeans. We have lots of the fungus that causes white mold in Kentucky, but the timing of key aspects of the disease cycle are normally out of sync here. However, the additional early season moisture coupled with the coolest July in 100 years apparently changed all that. Hopefully we won't see another serious outbreak of the disease here until the next coolest July occurs in 100 years! Today, August 12, 2009, the USDA released its Crop Production report. The report indicates increased corn and soybean production over last year, mainly due to production increases caused by good growing conditions. According to the Crop Production report, corn yields are expected to average 159.5 bushels per acre, the second highest yield on record. The USDA also revised planted acreage in this report from the June report, in which they slightly decreased corn acreage by 100,000 acres from the June report. Producers are expected t o harvest 80.0 million acres, up 2 percent from last year. Coupling good yields with a small decrease in acreage corn production is expected to increase by 5 percent from last year to 12.8 billion bushels. This would mark the second largest corn crop on record. The U.S. soybean crop is also looking good. According the Crop Production report, soybean yields are expected to average 41.7 bushels per acre, an increase of 2.1 bushels per acre over 2008 but .9 bushels lower than the July Crop Production report. Revised planted soybean acreage came in slightly higher than the June report. Producers are expected to harvest 76.8 million acres, up 3 percent from last year. Additional acres and good yield prospects pushes soybean production into a record tie with 2006 of 3.2 billion bushels, 8 percent more than last year. Kentucky corn and soybean producers are also looking at good yields, while wheat yields were lower than expected. According to the USDA, expected corn yields are up 14 bushels per acre over last year to 150 bushels per acre. This would be the second highest corn yield in Kentucky. For soybeans, the USDA increased expected yields by 6 bushels per acre over last year to 40.0 bushels per acre. For wheat, the USDA decreased yields by 14 bushels per acre over last year to 57 bushels per acre. The latest USDA Crop and Weather Report for Kentucky indicates that the corn and soybean crop is progressing even with the cooler temperatures experienced in July. With the late plantings and cool July temperatures, most of us think that the corn and soybean crops are behind. However, the report says that for corn, 20% is at dent compared with only 16% a year ago and 34% for the 5-year average. Corn in the milk and dough stages is behind the pace of 2008, however. Soybean blooming is slightly ahead of 2008 and on pace with the 5-year average. About 48% of the soybean crop is in the pod stage compared to 39% for 2008 and 54% for the 5-year average. We still need timely rains to get these crops to yield and the warmer temperatures in the forecast will help them continue with development. 2009/2010 ACRE payments will depend highly upon prices during the upcomming corn and soybean crop year - September 1, 2009 to August 31, 2010 and during current wheat crop year June 1, 2009 to May 31, 2010. Using current price and yield information it looks like the chances of receiving ACRE payments are highest for wheat, then corn, and lowest for soybeans. A short article using different price and yield scenarios to determine the chances of a corn or soybean ACRE payment can be found at: http://www.ca.uky.edu/agecon/index.php?p=110 and clicking on "The ACRE Program for Corn and Soybeans in 2009/2010"